In order to make roasted butternut squash soup, you must first roast the squash. I know that is sounds tricky, but you will be surprised at how easy it actually is! First you will need to cut the squash in half and spoon the "guts" out. Then place the squash face down on baking sheets. I line my sheets with foil for easier clean-up. Put them in the oven for 90 minutes. After 90 minutes remove them from the oven and allow them to cool. You will need to scoop the flesh from the skin, but as you can see, it pretty much just falls right out. Using a potato masher, mash the squash. Next place a large pot over a medium/high heat. Once hot add the olive oil and onions. Allow the onions to cook until they are tender and translucent. Now you will add the garlic, sage, thyme, turmeric, and cayenne pepper. Let cook for 1-2 minutes. This will help cook the rawness out of the garlic, and reconstitute the oils in the dried herbs. It will wake them up, so to speak! Using an emergent blender to blend the soup to a perfect smoothness or you can do it in a food processor or blender in small batches. Return the pureed soup to the pot and add the cream. Ladle out into your favorite bowl and enjoy! 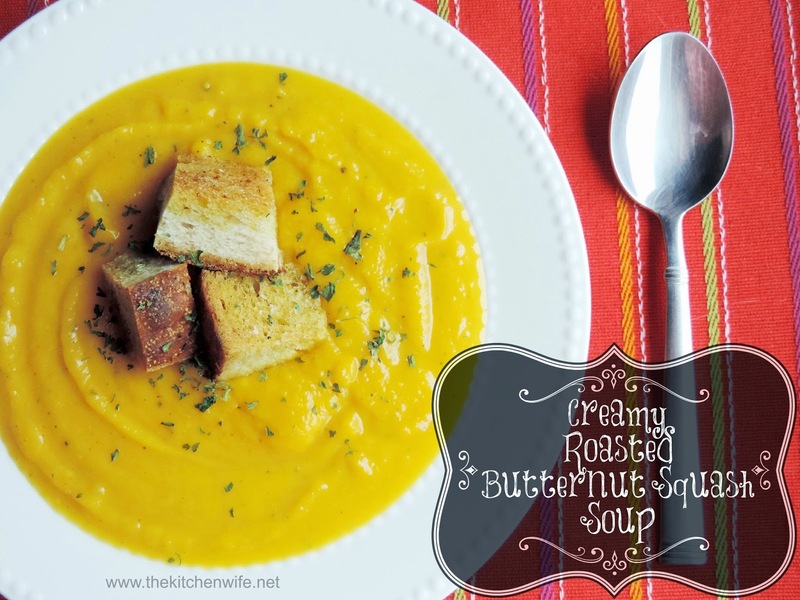 This soup is so delicious and it is also a great way to expose those picky eaters to some new flavors! I know it is going to be the perfect way to warm up during these chilly nights! Cut the butternut squash in half and spoon out the seeds. Place face down on a foil lined baking sheet. After 90 minutes remove from oven and allow to cool. Scoop the flash from the squash. Place a Dutch oven over medium high heat and allow to get hot. Add olive oil to the pot. Add the diced onions and allow to cook until soft and translucent. Add the garlic, thyme, sage, turmeric, and cayenne pepper to the pot and allow to cook for 1 minute. Allow soup to simmer for 10-15 minutes. Blend the soup until smooth and return to the pot.